With Mar. 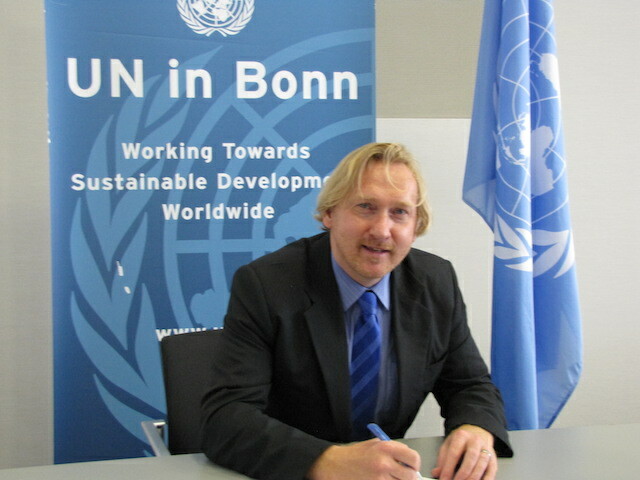 21 designated by the United Nations as the “International Day of Forests and the Tree”, Bradnee Chambers, the executive secretary of the U.N. Environment Programme Convention on Migratory Species, explains why he sees forest and species conservation as two sides of the same coin. BONN, Mar 20 2014 (IPS) - Of the endangered species listed for protection under the Convention on Migratory Species (CMS) a great many are forest dwellers – West African elephants, gorillas, bats and many birds. And it is not simply a case of the animals depending on the forest for food and suitable habitat to breed and raise their young — the forest often depends on the animals too. Conservationist and CMS ambassador Ian Redmond describes elephants and gorillas as “gardeners of the forest”. Elephants provide an invaluable service by uprooting trees, thereby making holes on the jungle canopy which allows light to reach plants closer to the ground and encourages their growth. Forest ecosystems, the most biodiverse of all terrestrial habitats, are often very finely balanced. Gorillas eat fruit and the seeds pass through their digestive tract to be deposited as fertiliser. Tropical fruit bats also play an important role in the pollination of plants. Forest ecosystems, the most biodiverse of all terrestrial habitats, are often very finely balanced. The more diverse, the more robust they are and the better they are at doing what we want – and need them – to do. While usually many species perform the same function, the removal of a top predator, pollinator or seed disperser can set off a chain reaction, with far-reaching consequences. A reduction in the forest’s resilience, increasing the likelihood of further species loss, can impinge on its ability to provide the ecosystem services, such as water purification and the production of oxygen upon which human well-being depends. The livelihoods of as much as a fifth of the world’s population are directly linked to forests, which also provide a home for 300 million people. 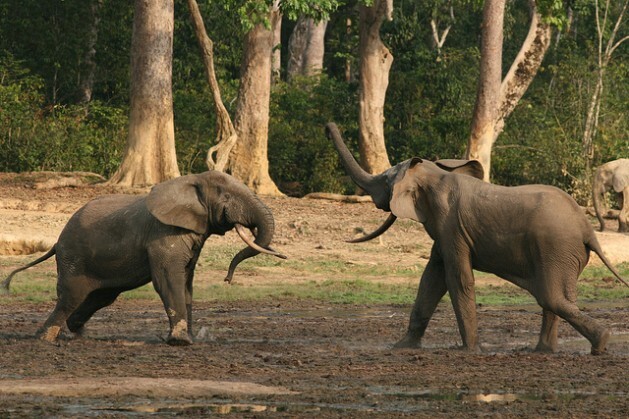 The presence (or absence) of an animal as significant as elephants can have huge effects on the character of the habitat, as has been demonstrated by comparing two similar forest landscapes in Uganda. Douglas Sheil and Agus Salim Center for International Forestry Research, Jakarta, Indonesia found in 2004 that the patterns of succession and regeneration in Budungo forest, which has no elephants, are totally different from those in Rabongo forest. Both forests are in Uganda where there exists a large elephant population. It has been estimated that approaching one sixth of all greenhouse gas emissions can be attributed to deforestation and forest degradation. A similar proportion of human-generated carbon dioxide can be removed from the atmosphere by forests acting as “carbon sinks” through sequestration. Tropical forests also help to cool the planet as large quantities of water evaporate forming clouds that reflect sunlight away from the surface. Eco-tourism is a booming business worth billions of dollars a year and wildlife watching forms a significant part of the sector. Sensitively managed, all players reap the benefits – the tourist gets the “close to nature” experience, employment opportunities are created in the local economy and the animals are seen as a valuable asset, not as an irrelevance, nuisance or a threat and therefore worth protecting. Visitors are prepared to pay fees of 750 dollars to see the mountain gorillas of the Virunga National Park in Rwanda, where 10 groups of the reclusive animals have now been habituated to human visits. The visits are conducted under strict conditions: no more than eight tourists at any time; no noise; no approaching the animals; no litter; and, given the gorillas’ susceptibility to human diseases, no participants who are visibly ill.
During the 1990s the mountain gorilla numbers rose by 17 percent, with the greatest increase amongst those groups habituated to tourists and researchers. Without gorilla watching and the associated conservation efforts it is probable that the mountain gorilla subspecies would not have survived. Instead it is estimated that today there might now be as many as 1,000 Mountain gorillas – still too few for the International Union for Conservation of Nature to regard them as anything more secure than critically endangered. The outlook is less rosy for the more numerous lowland gorilla subspecies, which are seeing their habitat destroyed by logging and conversion to agriculture and which are hunted for bushmeat, with some of the traumatised, orphaned young ending up in the exotic pet trade. The baby animals certainly look appealing and generally gorillas are characterised by their gentle demeanour, but they do not stay young and cute for long. They are totally unsuited for domestication with a two-metre adult male weighing in at over 200 kgs. Many endangered migratory species cannot do without forests; and the forests need the migratory species. Humans need both as they contribute to a healthy environment, a benign climate, a sustainable economy and to a shared natural heritage that enriches our live in ways that cannot be expressed in monetary terms.